3D Ultrasound & 4D Ultrasound Imaging! New Life Ultrasound uses cutting edge 4D / 3D ultrasound technology in our Houston area location to bring images of your unborn baby to life. You can actually see what your baby is going to look like before he or she is born! Parents now have the opportunity to see their unborn child in a way never before available. Watch the movements of your unborn baby inside the womb. Smiles, thumb sucking and waving can be seen with clarity that is difficult or impossible to achieve with 2D scanning. With 3D ultrasound scanning, you'll see your baby in a way you never dreamed possible. From a yawn, to a cry, to outstretched hands, you can now put a face to the name sooner than ever before! We can provide you a powerful connection between you and your child. At New Life Ultrasound, it's all about you, your family, and your first incredible experience with your unborn child. New Life Ultrasound has ultrasound packages and pricing that are sure to fit anyone's budget. We serve all of Houston's Surrounding Areas Including Katy, Sugar Land, Missouri City, Stafford, Cypress, Pasadena and more! * New Life Ultrasound is a limited diagnostic ultrasound imaging facility. We require that all mothers have documentation of their medical, diagnostic ultrasound. New Life Ultrasound is located in Houston, Texas and serves Katy, Sugar Land, Houston and the surrounding communities. 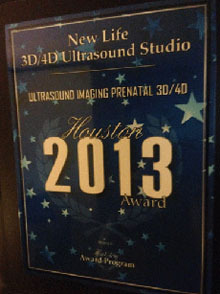 Choose New Life Ultrasound Studio, LLC for your 3D Ultrasound and 4d ultrasound experience in Houston.